New Delhi : External Affairs Minister Sushma Swaraj on Monday denied that India was rejecting medical visa applications of Pakistanis and asked Pakistan's top diplomat Sartaj Aziz to respond to her letter seeking travel permission for the mother of alleged Indian spy Kulbushan Jadhav who is on a death row in that country. In a series of tweets, the minister said Aziz, Pakistan Prime Minister Nawaz Sharif's Foreign Affairs Advisor, should not hesitate to write recommendation for Pakistanis seeking medical treatment in India. 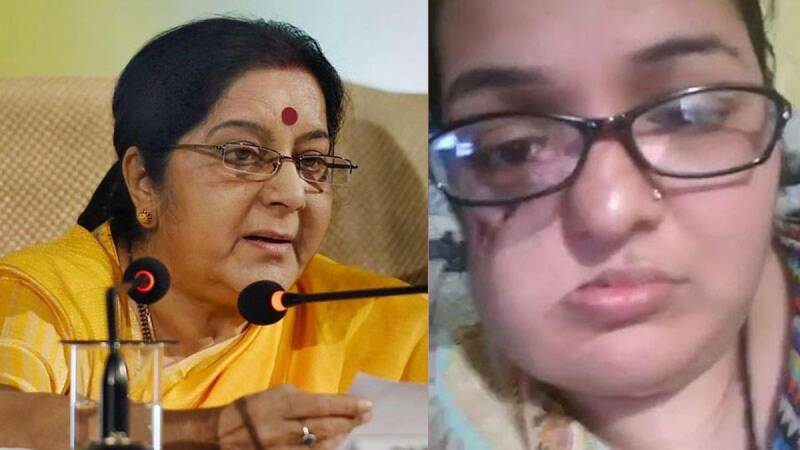 The remarks come amid media reports in Pakistan that the Indian Embassy in Islamabad had rejected the medical visa application of a 25-year-old Pakistani tumour patient who was to travel to India for treatment. Faiza Tanveer had sought Sushma Swaraj's intervention and help to "save my life". Sushma Swaraj said the Indian authorities would continue issuing visas but with Aziz's recommendation to Pakistanis who seek medical care in India. "I assure Pakistan nationals seeking medical visa with a recommendation from Sartaj Aziz, we will issue the visa immediately. I have my sympathies for all Pakistan nationals seeking medical visa for their treatment in India," the Minister said. Sushma Swaraj asked Aziz to recommend for those who need medical visa. "I see no reason why should he hesitate to give his recommendation for nationals of his own country. I am sure Sartaj Aziz also has consideration for the nationals of his country." The Minister also raised the issue of Jadhav and said she had personally written to Aziz regarding the visa to Avantika Jadhav who wanted to meet her son, who has been kept at an unknown military prison. "We also have a visa application pending for an Indian national, Avantika Jadhav who wants to meet her son in Pakistan, against whom they have pronounced a death sentence," Sushma Swaraj said. "I wrote a personal letter to Sartaj Aziz for the grant of her visa to Pakistan. However, Aziz has not shown the courtesy even to acknowledge my letter," she said. Jadhav's death sentence by a Pakistani military court has been stayed by the International Court of Justice. Pakistan alleges that the former Indian Navy officer was spying and involved in subversive activities at the behest of India's Research and Analysis Wing (R&AW) -- a charge India has denied.